Lately I got out all my old Legos and have been constructing some with my kids, it's been so much fun to relive all the memories, and now if they get a new set I love putting it together with them? I appreciate them, because they mean I get at least an hour of calm at my house. Kids love those things and I'm always amazed at how they can make things just using those little brains. Buzz for us is getting a Lego table with storage underneath for the girls. They've been watching too much TV lately and this is something to get their brains going and lets them have fun. My bare feet do not appreciate them one bit. Loved LEGO's growing up. Bummed that my folks sold all of it, plus all of my Star Wars stuff, when I went off to college. I collected Legos in the past and still do from time to time. They've gotten more expensive tho as I really just stick to the star wars stuff now. If I remember I'll post up some pics tonight. On a day where I'm just being bombarded with bad news and negativity, this just made my day. Heck yea! Go Legos! I used to have the words most epic cargo plane for my little lego guys to do awesome military missions from, and I built it from scratch. It looked like a box with a couple of fins for wings, but I thought it was the coolest thing I had ever built. "In February 2015, Lego replaced Ferrari as the "World's most powerful brand." Love my legos! I am 27 and I still will pull them out and build every once in a while, helps now that my niece is 4 and she loves them too. Cant tell you how many times she has come over and asked for uncle Matt to play legos with her. And I can never tell her no. Have any of you seen the new stuff? There is Lego set that you can build a functioning crane. I want one... Bad. Loved Lego as a kid. I have given my son all mine, he is 12 and still plays with it, and has heaps. Its frustrating trying to find that little bit you need in a massive pile haha, but so good when you finally do find it, normally while looking for another bit. DUDE, Legos freaking rock!! Coincidentally enough, we just stayed overnight at Legoland with the boys earlier this week. The place isn't the cheapest but it was amazing. The hotel is totally cool. Rides, waterpark, and the lego mini displays are just incredible...I'll try get some pics up. You guys HAVE to see the new Star Wars exhibit. It's absolutely amazing. I honestly probably liked it more than my boys did, lol. Heck yeah, there is a ton of sweet stuff, and big sets at that, the Walmart clearance isle has become our best friend for amazing deals on sets! 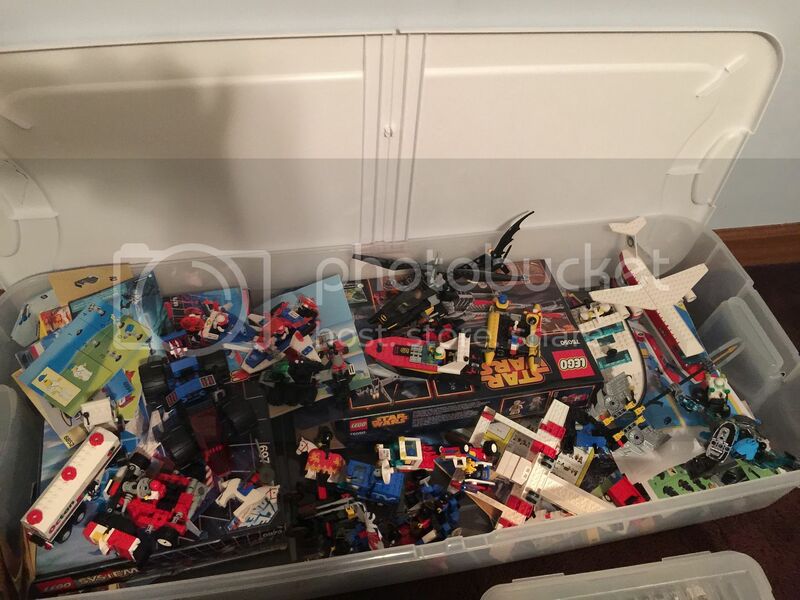 When my boys were growing up, my wife had a room in the basement that she called "Lego Hell". There were thousands of Legos in there. The boys got together a few years ago and sold them all for quite a bit of cash.